She is so easy to train, I wish they were all like her!" enthused Allison Sheehan after the gutsy victory recorded by talented mare Andrassy in the Debra Coombs Handicap at Caulfield on Saturday. 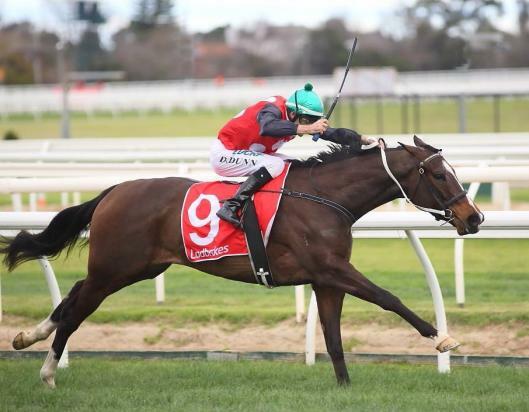 It was a milestone win for the tough five-year-old, her first beyond benchmark level. And there is more to come! Nicely rated by Dwayne Dunn, Andrassy was not the fastest away from her inside gate but she gradually made up ground along the rails, ending up leading and dictating. Looking to have plenty of petrol left into the tank as she headed into the straight, Andrassy was strongly challenged from the 100m but she pinned her ears back and just kept fighting - recording her sixth win from just 17 starts. The winner of over $170,000, Andrassy impressed Dunn who was aboard for the first time. "She fought really hard," he said. "I didn't expect to lead but they went slowly and we got left alone. It was just a matter of letting her step through her gears." Allison was delighted - "she goes super fresh," she said, "and she loves it here." Every win by Andrassy is a thrill for Allison, the bay being the first horse she bred. A daughter of the Listed winning Redoute's Choice stallion Sharkbite, Andrassy is the first foal produced by the well related Desert Sun mare Pride Of Ardrossan, a multiple winner bred and raced by the late John Gilchrist. He also raced Pride Of Ardrossan's dam, the seven times winner Royal Sencherec who was second to Crystal Palace in the Queensland Oaks. As a tribute Andrassy races in the Gilchrist colours and John's son Matt is a proud part owner. Currently in foal to Canford Cliffs, Pride Of Ardrossan is also dam of the promising winner Jawsome. She has a return date with Sharkbite this spring.